Everyone is seeking it, a place to belong, a place where we are known and accepted and even loved. We were created for that, not only finding it with God but with one another. What’s that got to do with chili? I’m glad you asked, it’s why we have a chili cook off every year. I’ve lost count now of how many chili cook offs we have had through our 11 years together but the goal in each is the same - win the chili cook off!! Nooooooooo. The goal is creating a place to belong - a place for our New City people to connect with friends and MC leaders, maybe to meet people they don’t know. But more than that, our goal is to create a place where those who don’t belong in a gospel-centered family can. Our hope is to create an event that our New City family (that’s you if this is your church home) can not only come and enjoy, but an event that you can invite others to enjoy with you. Our hope is to provide a place where your unconnected friends can connect with your church family. The chili cook off is an opportunity to be missional through relationship. Many people have given up on church, not because they don’t believe in God or even the work of Jesus, but because they have been hurt by people in the church. The chili cook off is an opportunity to reintroduce those people to your family. Perhaps for others, their only experience with church is through the many stereotypes they’ve seen and heard about (imagine the strangest of those!). The chili cook off is a great opportunity for those friends to see and experience the truth about our family. Yes we may have a crazy uncle or two, but for the most part we’re just regular people. In either case, the chili cook off, like our summer lake day, is a fun way to introduce unconnected friends to your family. Its an easy, non-threatening way to give others a place to belong. 1) Talk about the missional aspect of the event with your spouse and MC. It’s easy to think of this as “just a church event,” but it should be more than that! 2) Pray and think about who you know that may need a church family to belong with. 3) Invite someone to join you. Ride together, make chili together or just meet here but take advantage of the opportunity. 4) Come as an MC. The mission was never meant to be engaged on by individuals. This is a family effort! If your whole MC is gathered, cooking s’mores over a fire and sampling everyone’s chili and hanging out, you provide a natural place for your unconnected friends to connect! 5) After the event pray for God to use the time to connect your friends to your family. Pray as well that they join you at a New City gathering or at your MC. When my wife and I lived in the Dominican Republic we developed relationships with several long-term missionaries there. In many places, missionaries come and go often; sometimes only for a couple of months at a time. This takes a toll on the long-term missionaries there because they develop family and share life with people only to see them leave months/years later. Even though people are leaving to go where God leads them, it is still difficult to see them go. Multiplication within missional communities, much like relationships within foreign missions, is difficult and messy on nearly every level. It takes energy, emotion, and relationship. Ultimately, it means some of your dearest friends and those you have invested in the most leave you for something else. Despite this, we step into multiplication because the gospel is worth it and Jesus commands us to go and make disciples. For all of its difficulty, the sending of new communities is an incredible apologetic for the gospel to others. Brad Watson, equipping leader with Saturate, says in regards to planting new MC's that, "sending new people out means an increase in gospel demonstration and proclamation." Multiplying missional communities requires multiplying leaders. The process of new MC's beginning in new neighborhoods begins with two or three leaders with a deep love for Jesus (who He is and what He has done) and a track record and/or desire for service (people who are leveraging their lives for others and the gospel). Let me share a story with you. The Crosby MC began in 2016 with a small group of people willing to step into leadership and a vision for reaching the lost. With around 20 people in their community, they began to share life together; eat together, play together, and love together. This group began to grow and see more and more people come into their family. This meant more and more people were learning the truth of the gospel and seeing that truth transform their lives. This group grew to around 40 people within a years time. The Peek MC was planted from this group. Then, not long after, the Warner Robins MC and the Tattnall Square Park MC were planted. This month, the Peek MC has planted another MC. From that seemingly small beginning, we have seen five Missional Communities planted. Think about it this way: in 2016 there were 10 people in one MC and now in 2018 there are roughly 100 people in five separate but still connected MC's. This is now five groups doing mission in different places throughout Macon rather than only one group. Some are in their neighborhoods, others are in parks, while others are on mission to the businesses of downtown Macon. This is now five MC's who have space to invite outsiders into their homes, lives, and families rather than one. This is multiplication. This is gospel advancement. This is Kingdom work. People are encountering Jesus for the first time. God is bringing His people back to Himself. He is redeeming and restoring what has been broken. Now is the time. Let's embrace our God-given identity and live as a family of missionary servants making disciples. Put your "yes" on the table and let's plant more Missional Communities and reach more people with the gospel of Jesus. Would you be willing to lead or host an MC? If so, let us know here. Do you want to go through our training this Fall to get a better idea of what it would look like for you to help lead? Email me. Multiplication is hard and messy at times but the reward is great! While Christmas may be “the most wonderful time of the year,” it’s also one of the busiest and most stressful times of the year. Often times, we rush around to decorate our homes, attend Christmas parties, make memories with our families, make and send Christmas cards, and buy gifts – all on top of our normally packed schedules. For those of us who lead in the church, from elder to staff member to dedicated volunteer, our service to our church family crowds our schedules even more. We are just a few days away from Christmas and many of us are probably finding ourselves short on time to finish up our Christmas to-do lists,. The hope of making this year’s celebration meaningful and memorable seems to be a fleeting thought. 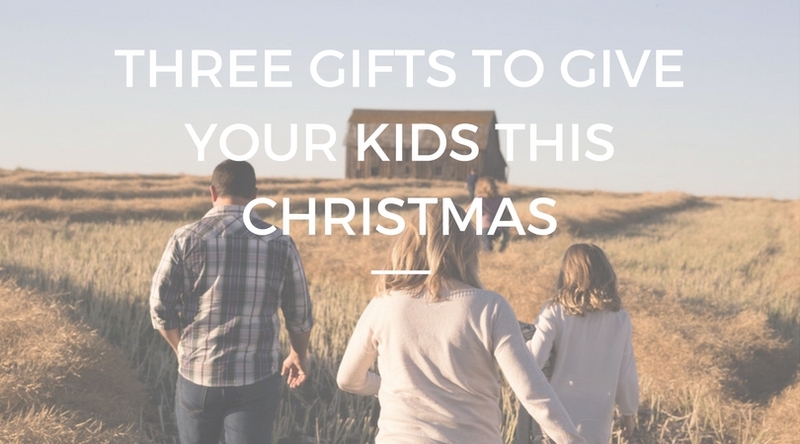 Whether or not your children get their “must-haves,” there are a few gifts that won’t show up on their lists that may just be the most important. For kids, there’s nothing like presents piled high beneath a tree on Christmas morning. But even if you got them everything on their list and more, it’s far more important that you remember to give them the gift of yourself. It can be tempting to think that because we sought out, paid for, wrapped, and gave a bunch of great gifts that our parenting duties for Christmas are done. That is far from the truth. As parents, we are called to represent the heart of God the Father to our children. He doesn’t simply give us gifts that we want because we want them. What He wants most is for us to enjoy Him, not the gifts He gives us. That’s what we really want and need, anyway – to be known and loved by our Father God. Our kids, too, want something more than a new toy. They want to be known and loved by their parents, and to be secure in that love. And as you give them that gift of yourself, you are pointing them to their deeper desire to be known and loved by a heavenly Father. So, after Christmas lunch, resist the urge to go take a nap, watch TV, or get some “me” time in. Take time to play with all the new toys that you just gave your kids. Watch your favorite Christmas movie with them, even though you've seen it ten times already. Get beaten at that new video game over and over again. Build a tower with their new blocks, watch them knock it down, and help them build it again. By giving the gift of yourself to your children, you’ll be blessing them and yourself as well. And after all, the best gift that God ever gave us was the gift of Himself, as a baby boy on that first Christmas morning. In Acts 20:35, Paul quotes Jesus as having said “It is more blessed to give than to receive.” As a new parent, this year will be the first year that I have the opportunity to stay up late on Christmas Eve and prepare the living room with Asher's presents. This is something I've waited so long to do; it will truly be much better to give than to receive this year. However, our children simply won’t believe it. Their Christmas lists are full of things that they want to receive, not things they want to give. That means it’s up to us, their parents, to lead them to experience and understand this great truth. Find ways for your family to give to others together this Christmas. Talk to your Missional Community about any needs in the community, or simply make cookies to give out door to door to your neighbors. I know of one family who wanted to serve children in the Dominican Republic over the summer, but they were having a tough time raising all the needed financial support. So, they decided to use most of the year’s Christmas budget toward their mission trip, and let their kids know about their decision. While it wasn’t the children’s favorite Christmas morning ever, after the trip, they expressed how thankful they were that their parents had made that decision. Their eyes had been open to the true joys of generosity. As you lead them in generosity, you’re giving them the gift of joy. After all, Jesus Himself promised that it is more blessed to give than to receive, so it’s a promise you can count on. Only the Holy Spirit can draw your children to know and trust in Christ. However, there is a lot that we parents can do to point our children to the joy of knowing God and to their need for a Savior. 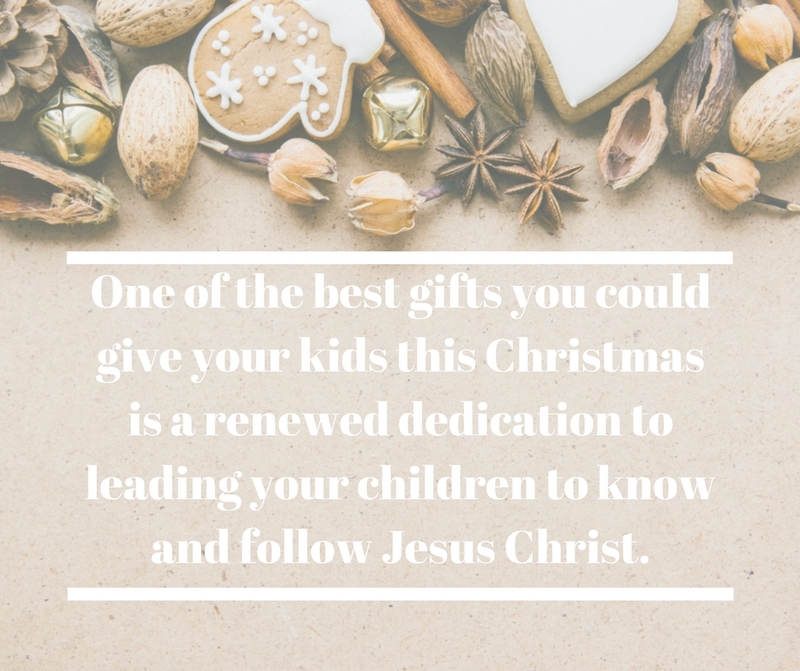 One of the best gifts you could give your kids this Christmas is a renewed dedication to leading your children to know and follow Jesus Christ. It is only after he says this that Moses talks about teaching your children diligently as we go about our lives. Another gift you can give your children is leading them to know God themselves, not simply by your example. If every child in your home doesn’t have their own, age-appropriate Bible, then I recommend adding that to the gifts under the tree this year. The Jesus Storybook Bible is excellent at pointing our minds to Jesus throughout all of the stories of the Bible. Also, pray with your spouse about how you can help your children develop the habit of reading the Bible and praying daily, either as a family or individually. Even though these three gifts – the gift of yourself, the gift of giving, and the gift of knowing God – won’t make any child’s Christmas list this year, I guarantee our children will be blessed on receiving them. I pray that we all will find time in this busy Christmas season to make these gifts a priority. Many times we struggle with living out what we know. As a church, we tend to gravitate to 'knowing' more but flounder when it comes to transferring our knowledge to action. I mentioned adoption and fostering in last week's sermon in connection to living as a community, a family. As a foster/adoption parent, I can tell you from experience that the following post is a simple, but powerful way to reflect that you not only understand the gospel, but you are choosing to live it out. Two years ago I ran into a friend who I hadn’t seen in weeks. “How are you?” I asked. She had just started fostering a sibling group of three kids about two months earlier. Tears formed in her eyes and she began to weep. “You are the first person in weeks to ask how I have been,” she said. I was stunned; partially because this woman was clearly struggling and isolated, but even more so because this woman was an active member of her church and lead bible studies. She was plugged into her church community and it was no secret to anyone she was fostering. Where was the church body in this? The body of Christ? The Village? Why was it in a church full of young families, constant play dates, and VBS, this family was receiving no support from the church body? Unfortunately, this family is no longer fostering and joined the staggering statistic of 50% of foster families who stop fostering after their first year. Fast forward two years and my husband and I began fostering. It wasn’t long before we took in 10 different placements at various times, over a 2 month period. Our first placement was a little boy, and the second another sweet boy, and the third placement was a sibling set of two boys and a girl. The flood gates opened and we were on the front line living life with these kids; all precious and all traumatized. With each placement, we found a member of our church at our door, bringing meals, boy clothes, pull ups, and formula. A friend brought over her therapy dog and bubbles to keep the kids occupied one afternoon, and another friend showed up with a crate of fresh eggs from her coop. Teenagers from the youth group came over and handed my husband Josh and me iced coffee (my personal love language) then stayed for hours playing with the kids to give us a breather. Josh and I were running a marathon and this love and support gave us the continuous cup of cold water needed to keep running the race. Our experience is rare; embarrassingly rare, especially when other foster families catch wind of our support that they have been so desperate for. Is the church filled with terrible and apathetic people? No. But perhaps the church has blinders on and doesn’t realize their role in foster care. Not everyone is supposed to be a foster parent, but every Christian is supposed to play an active role in orphan care. What actions can the church body do to live out James 1:27? First, recognition must take place that taking care of orphans is a commandment, not a calling. James 1:27 uses the word “visiting” when describing orphans. The word visiting is an ongoing word of action, not simply a one-time event. Within this commandment of “visiting orphans” are individual callings. Some people are called to be foster parents and others have a place to support those families. Here are some specific yet simple ways to be the village and the body of Christ, to foster families in your church. Create a Meal Calendar- A one-time meal is nice, but this foster family is running a continual race. If you have more than 10 families in your church, each family can sign up to bring a meal once a month. Free Babysitting- In most states, there is a “normalcy” clause when it comes to foster children. That means, if you would allow a babysitter to come over to watch your kids for a couple hours, then that is also appropriate for foster kids. Offer free babysitting to the foster family. Clean the foster family’s home for an hour– Tell the family you are coming over for an hour to clean/organize, or do their laundry. Give Care packages– Diapers, food, formula, kids clothes, car seats. These kids are dropped off at this family’s house at a moment’s notice with typically nothing besides the clothes on their back. Send members of the Youth Group over to play with the kids on Saturdays- These foster children will be blessed by the love and the fun with the teens, and this is also a great experience for teenagers to see their important impact. This is not an exhaustive list but is a good start. These meals, these acts of love are the game changer which keeps foster parents in the game verses throwing in the towel. My hope is that this list is shared and then implemented in churches around the country. It will change and refresh foster families and will also change churches. It’s time for the Church to play their part, to be the village and the body of Christ which is so clearly articulated in the Word. This past week we spent our time in Philippians 1:12-26 as Paul demonstrated his absolute commitment to Jesus and His mission, even while he was in prison facing a trial that could lead to his execution. His demonstration of Jesus' Gospel becoming his own Gospel was a powerful illustration of commitment to serving God's Kingdom and not our own. We all have challenges and circumstances that we can use as a reason to not live out the call on our lives, but don't fall to the temptation. Paul relied on the Holy Spirit and the prayers of friends to remember his identity in Christ. His actions revealed his heart. When life get's hard or distracting, how do you keep your focus on God's Kingdom and not distracted by our own? Take a moment to read one family's struggle with the same temptation and their fight to stay on the mission God has called us to. Families with complicated lives can still be missional. How was a family like ours supposed to live out the practice of discipleship? The instruction in Matthew 28:19 seemed impossible for us. Roughly six years ago, a miserable “stomach flu” turned into cause for celebration; I was pregnant with my second child. My husband and I had previous miscarriages, so we held our breath through the first trimester. After a few months of a normal, healthy pregnancy we apprehensively picked out a name for our daughter: Katherine. At 35 weeks, however, my unremarkable pregnancy turned perilous. A sonogram revealed our baby had developed fluid on her brain, building up dangerous pressure under her skull. Further inspection also uncovered the evidence of a stroke. Katherine was delivered within 24 hours of the frightening discovery, and throughout the next year she was diagnosed with Cerebral Palsy, Epilepsy, Blindness, Autism, heart defects, and much more. Our lives changed almost immediately. Medical bills and appointments began to stack up, and my husband had to pick up a second job. Meanwhile, I quit my career to chauffeur Katherine from hospital to hospital. Our parenting debates even changed; instead of cloth versus disposable diapers, we were discussing whether our infant should take Klonopin or Valium. By the time Katherine was two, my husband and I were mostly adjusted to this new reality, and these once-intimidating tasks were almost easy. We were still stumped by one problem not medical in nature, but missional. How was a family like ours supposed to live out the practice of discipleship? The instruction in Matthew 28:19 seemed impossible for us. “Go, therefore, and make disciples of all nations.” Jesus couldn’t have meant all Christians, right? In addition to the responsibilities all families juggle, Katherine had an average of ten appointments per week and a dozen medications to keep track of. We felt like we had too much on our plate to be effective disciple-makers. We believed our family was the exception to Christ’s commandment, and so for several years we were only on the receiving end of discipleship. Friends would serve us, counsel us, encourage us, and teach us. It seemed unlikely we would ever pour back into anyone other than our kids. Eventually we realized our perspective on discipleship was too limiting and that Christ’s call was for everyone—even special needs parents. Modern evangelical culture has painted us a somewhat narrow picture of discipleship. When most of us think about discipleship, we imagine the weekly coffee shop cliché where we quietly discuss the Bible and swap prayer requests with ease. This style of discipleship will probably never be attainable for me or my husband. The Bible provides us with more than one method when it comes to discipleship. The disciples of the Bible learned from Jesus while they worked and ate meals together (Luke 5:27–32), as they traveled together (John 7:1–13), as they celebrated holidays together (Matthew 26:17–30), and more. We are not limited to the peaceful coffee shop Bible study but are free to make use of our everyday routines to build up the church body. When we understood discipleship is a way of living rather than a specific event or meeting, making disciples seemed much more attainable despite our situation. For our family, “life on life” discipleship now included medical appointments, wheelchair fittings, and IEPs. In fact, bringing other people into this unique world of ours has become our primary discipleship methodology. When others enter our most vulnerable spaces, they aren’t just spending time with us but get to witness struggles they never considered before and are brought into contact with people they never would have met otherwise. For example; several church members have sheepishly admitted to me that they once felt uncomfortable around those with intellectual disabilities, but spending time with Katherine has reduced their unease. Confessions like these showcase the fruit of our discipleship efforts. These friends were once afraid to love freely and engage an unreached and isolated people group, and now they are able to simply because I had them tag along for a few appointments. As our community lives alongside our family, they are being equipped to share the Gospel of Jesus Christ with everyone. If we had refused others access to our unique experiences, we would have denied them an opportunity to grow as disciples. Even with this new perspective, discipleship as a special needs parent still requires some practical adjustments. Participation in our church’s missional communities was a challenge. Our daughter can’t walk, and most MC leaders don’t have homes that are easily accessible for her. It was tempting just not to participate at all, but we decided to host our missional community at our apartment instead. This is somewhat unique for families like ours, who tend to sequester themselves into their houses with limited community contact. If someone had asked me five years ago if I would have a dozen people over for dinner and fellowship once a week, I would have laughed at them. God used our unique challenges as parents to push my husband and me out of out comfort zone, and now sharing our home is typical for us. It’s a challenging reality that our daughter may never be able to read the Bible or understand exactly what Jesus Christ did for mankind. My husband and I are supposed to teach her the Gospel as well, but she may be the toughest one to teach! While there are many unknowns when it comes to her discipleship, I do know this; Katherine is beloved by our church family and is constantly surrounded by disciples who are trying to make more disciples. By merely opening our lives up to our brothers and sisters, our disabled kindergartener has seen discipleship and community more clearly than many adults have. That communicates something powerful to a little girl with limited understanding—that community living and discipleship is God’s desire for those who love Him. One of the questions I am often asked of people interested in joining a Missional Community at New City is, "What do we do with our kids?" It is often asked as if a family had attended a small group before coming to New City, but there was some resistance for children to attend. Keep in mind, when we think about children and our missional community, we ask: How can our children join us in the overall mission? How do we disciple them all week long? How do we make sure the mission is accessible for them? How do we ensure they can participate? How do we help them reach their peers as well? When we think about our gathering on Tuesday nights, we don’t feel like we have to address all of these in our 2–3-hour time together. We address these through the whole-week approach. Stepping back from the once a week, 2-hour Family Gathering, the question really needs to be asked from an all of life perspective in order to help us understand how to handle kids during the weekly event. If an MC is intentionally doing life together in community, children will be discipled during the normal course of the week. This could include family devotional times, meeting with other families at the park, enjoying meals together, and even recreational sports. Our children also should be included in our monthly Third Place activities as well as the Missional Focus that the MC is engaging. This gives parents an opportunity to not only talk about their lives as a family of missionary servants, but to show them that their daily lives are fully engaged in practical life practice. Most children, like many adults, learn best by combining action and words. Incorporating our children into regular rhythms of loving and serving others allows them to grow up in community and increases their value of it. When we look at the specific Family Gathering, we need to be very intentional with our time. We are intentional about meal planning, finding childcare, crafting questions and inviting, so we need to be intentional with our children. Here are a few ways that will help in blending children into the MC Family Gathering. Time – Start and stop on time. Not only does this respect the time of your MC, but it also helps to clarify the time frame that the children’s time needs to be planned. Typically, the MC conversation lasts 45 min. to an hour long, so that is about how long kids will be separate from the adults. Variety – Normally we have children of a variety of age groups, so planning one activity to engage every age is difficult. Also, if the kids do the same thing every week, boredom will quickly set in and intentional discipleship time could be wasted. I have found that coming up with a rotation (stations) is extremely helpful in keeping kids engaged, and providing a structure for the childcare worker to work from. A rotation doesn’t have to be super complicated and can include a bible story, watching a short video, coloring, free play, outside games, a craft, etc. Place – While we encourage our MC’s to keep their kids with them during the meal time and some can even enjoy the other activities that MC’s often incorporate into their Gathering such as prayer time, music and even hearing someone’s Story, it’s important to for them to have a space of their own. This could be an extra bedroom, a separate living room, or even a tent in the backyard where kid's can play, watch, read or work on crafts. Children can be an important part of a Missional Community, not a hindrance that must be endured. Children in community have the unique opportunity to see their parents living out their faith, so clear pathways for them to engage is important. Having someone who can spend time with the kids instead of a parent, allows parents to fully engage in the conversation and for some, give a much needed break from a difficult week. Remember that you are not being stuck back with the kids, that your discussions are NOT superior and more important than your interactions with these young ones. You can’t look at these kids as a hindrance or interruption. They need to be taught and guided, and sometimes, depending on their ages, this needs to be done in a separate area of the house so they can best learn and engage. It is an honor and privilege to pray for, prepare lessons for, and to hang out with them. Most of the obstacles in our own group have been not logistics but a heart issue. I have totally struggled with this in the past, which is why I feel I can speak into it. My heart in the past has looked down on this task and looked at it as overwhelming and “not fair” that I am always “stuck” with figuring it out. I am ashamed of that—but thank you, Jesus, for interrupting my thoughts and forgiving this sin, revealing to me this is a situation to embrace, not “solve.” Hopefully, by the grace of God after a little teaching to your adults, you will have people arguing about who gets to be with the kids next. I will pray you will see that happen. If you are new to New City and considering joining a Missional Community, know that your children are welcome, planned for, and engaged with. If you would like help in getting plugged in, contact Patrick at patrick@newcitymacon.org.